Over the Easter break from school, my wife and I sat down to start Jesus of Nazareth on video (alas) with our sons. We are watching it in about hour-long sections. They're enthralled. The philosophical questions are flying. Woe to my sons' theology teachers, that's all I can say. Last time I watched the film, I was still a fledgling musician, but after having watched the first part of it a few weeks ago, I went up to my piano and found that, somewhere along the line, I had become able to understand and play the theme (and its harmonies) that eluded me for years. Sometimes, it is nice to get older and wiser. But my most vivid connection to the film comes out of a memory. 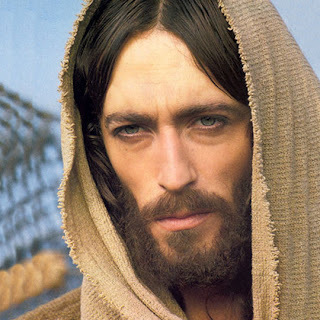 I remember feeling a deep desire, as a little kid, while I watched Jesus portrayed on screen by Robert Powell to, someday, grow up to portray Jesus in a film, myself. It makes me smile to remember this -- the innocence and, at the same time, the profundity of it moves me. What I wanted, I realize now, was to be like Jesus. At any rate, I wanted to be like Jesus. As a boy, I recognized that this was what a perfect man would be. Powell's portrayal gives us a man whose soul is peaceful; whose presence is riveting; whose love for those around him is apparent; whose wisdom is flawless; whose very words bring peace and wonder to those who listen. It is funny for me, today, to see that, although I had forgotten about this childhood desire to "play Jesus in a movie" that I became a teacher and a storyteller -- in pale imitation of my (until recently) forgotten screen inspiration. Of course, I'll never reach the level of what I admired as a child -- not to any level that approaches the perfection of the figure I watched portrayed on that screen. Maybe I knew this as a boy, so I made my expectations microcosmic: life into film. I wanted to act (and "act") like Robert Powell -- to be like him...and Him, at least as far as I could. As I often do, I wonder what that boy that I was would think of the man I have become. I wonder how he would critique my performance.